(CNN) - The cell phone videos show the underbelly of American society. Racist vitriol, mostly directly at Latinos, shared on social media. 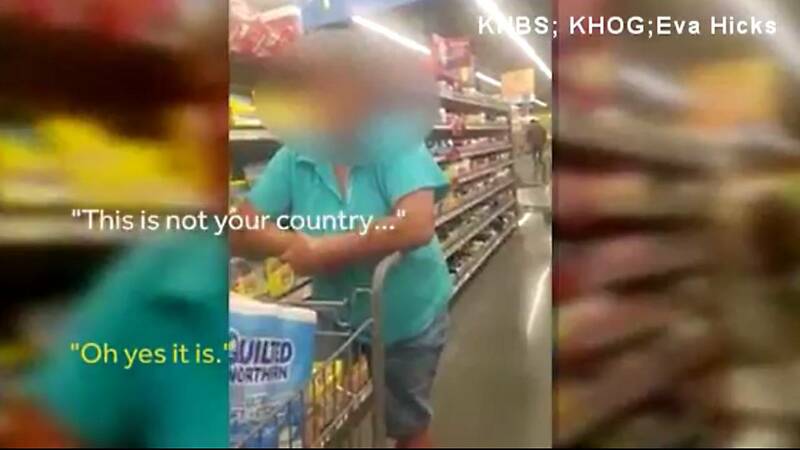 In an Arkansas Walmart, an unidentified shopper told a woman "go back to Mexico," and called another woman the N-word. At a Nevada airport, one man yelled profanities at another man speaking Spanish on the phone to his mother. And in a Virginia Sprint store, a woman hurled a racist slur at a customer named Juan, saying: "This is my f***ing country." Walmart said it would ask the customer to no longer shop at their stores. Sprint's CEO said he and colleagues were "disgusted" by the woman's actions. "It means that America is back where it was ... decades ago. That kind of thing went out of fashion with the Civil Rights movement; the Trump campaign brought it back into fashion," said the Rev. Joseph A. Darby, vice president of the Charleston, South Carolina, NAACP branch. President Donald Trump "tapped into seething anger" that was already boiling in those who couldn't accept an African-American President, Darby said. Trump "legitimized bigotry by the way he campaigned." "People who found their hope in him feel emboldened to say and do things that they wouldn't do before ... It leads to all kinds of foolishness that people have kept under wraps before because now they feel empowered because they think they have a President." Darby said he believes some of the rants also stem from "fear on the part of some misguided, for the lack of a better word, ignorant people who believe they are losing their country, with their country being a white country." He said: "They feel that they're going to lose the privilege of being white, and when you have fear, you do ugly things sometimes." Teresa Carrillo said the rants illustrate an anti-immigrant sentiment in the country, which isn't new. The nation has experienced rants and derogatory language that created hostile environments for immigrants, including anti-immigrant campaigns that preceded deportations in the Depression-era, she said. "It's cyclical. It goes along with the policies of the day and the ideology of the day," said Carrillo, a political scientist and professor with San Francisco State University's Department of Latina/Latino Studies. But cell phones now bring it "into our consciousness in a much more emotional way," she said. "There's one part of this that could move us forward as a society ... It's in our face now, and we can't deny that it's happening," Carrillo said. She said: "People who are recording them may feel like it's an injustice, and that's why they are recording it -- and you can see some of the responses." But she said while the rants are bothersome for people to witness, "it's kind of uncomfortable for people to talk about the ugly side of racism." "We have to decide as a multicultural society are we going to look away when this happens or are we going to work to move towards change, and publicly show that that is not the popular sentiment," she said. "There is a clear push back against diversity in our society. When you look at the battle on college campuses, you see that there's been a rise in hate groups that have spurred up across the country," said education consultant Andre Perry, citing speeches by white nationalist Richard Spencer on campuses. Perry, a columnist for The Hechinger Report and a contributor to CNN.com, pointed to the recent stabbing death of Richard Collins III, a black Bowie State University student. Police charged University of Maryland College Park student Sean Urbanski, 22, who is white, with killing Collins, 23. Police said Urbanski was a member of a Facebook group called "Alt-Reich," which spewed hate toward black people and other minorities. Perry said "Collins was made a target by white nationalists and separatists feeling comfortable spewing their hate." "When a President of the United States installs a cabinet member who hosts a virtual salon for white nationalists -- I'm talking about (Steve) Bannon being the publisher of Breitbart News -- it's not surprising that people are feeling comfortable spewing hate wherever they see threats to whiteness," Perry said. He added: "There are white people who are feeling the cultural and linguistic threat of diversity, and the only way for them to handle that anxiety is to hurt others." "What they reflect more than anything else is similar to what we are seeing with police shootings is that this is not a new phenomenon," said Jack Glaser, a professor of public policy at University of California, Berkeley. "What's new is the ability to record it." "I think we have a certain percent of the population that is virulently racist, and that they will express that from time to time," he said. "There is no evidence the rate of which African Americans are being shot by police is any higher in the last few years than it was decades before," he said. "But what's clearly changed is our ability to document it and people to transmit that information instantly through social media."